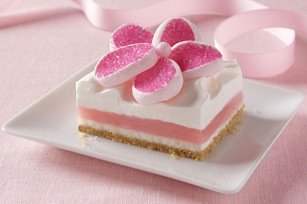 Create a fruity treat with these Strawberry Cream Bars with STRAWBERRYMALLOWS Flowers. Our Strawberry Cream Bars have a tasty graham cracker crust. Mix graham crumbs, 2 Tbsp. granulated sugar and margarine; press onto bottom of 13x9-inch pan. Beat Neufchatel cheese, remaining granulated sugar and 2 Tbsp. milk with whisk until blended. Spread over crust. Beat remaining milk and pudding mixes with whisk 2 min. ; pour over Neufchatel layer. Let stand 5 min. Cover with whipped topping. Refrigerate 4 hours. Cut each marshmallow crosswise into 5 pieces with kitchen shears to resemble flower petals. Press cut sides in colored sugar. Arrange petals, sugar-sides up, on top of dessert to make 12 flowers; fill centers with candies. To make the dessert easier to cut into bars, place in freezer for 1 hour before cutting to serve.